What seems to be a tradition now with any ASIP compilation (Europe, Uncharted Places and now Full Circle), we enlisted Kevin Bryce to make a limited, hand-made wooden companion to the main release. This time, Kevin made five beautiful CD cases, which were modeled off the main Full Circle artwork by Mario Morales. 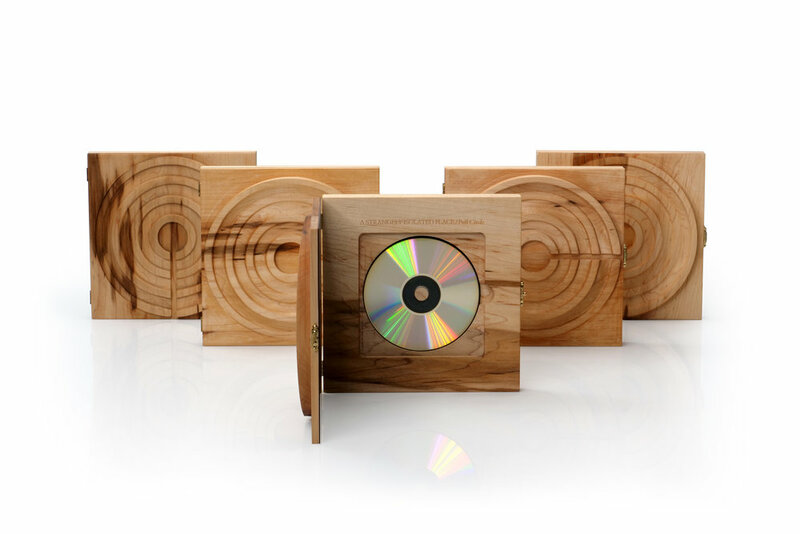 The vinyl artwork was a 3D take on the ASIP logo, and Kevin decided to take the 3D files used to generate the design, and make a real-life wooden version. Like everything Kevin has done for us (the Uncharted Places CD case and the Europe Vinyl Case for example) it turned out absolutely beautiful. Hours of craft and detail went into it, producing a prototype case which was near to spot on. All we did after the prototype version was deepen the inlay to host two CD’s and add a black felt, and title text on the inside. Then once the design and build was final, Kevin and a friend went to work sanding, detailing, and finally oiling. The five CD cases were made available with the Full Circle vinyl release and sold out instantly back in December. Since then, Kevin has been busy finalizing them ready for delivery. A big thank you to Kevin for the outstanding craftsmanship and effort he put into these. And thank you to the five people that snapped them up. We hope you not only enjoy them, but place them with pride for everyone to see. All profits from this, and the main Full Circle release are going to charity - The Harmony Project. I had access to a ton of hard Maple that had been used to make butcher-block style restaurant tables, so I went through several large piles of wood to select some wood that I thought would work for the project. I wanted to find wood with some unusual grain patterns, the main problem being trying to find neat looking wood with wood that would be structurally sound enough to handle being cut into the relatively thin pieces I would need. Once I had the wood, I began testing the 3D cut file. It took some time to get the optimal balance between time spent on the CNC and a smooth workable finish. I eventually found the right balance (or so I thought) and proceeded to cut all the pieces for the project. Once I had all the pieces cut, it was just a matter of sanding it to a smooth finish. Unfortunately I hadn’t fully grasped just how hard this particular hard Maple was, so after spending more than eight hours sanding the first one, I enlisted the help of an old friend who I had worked with for years and years at a local Vancouver guitar shop. Finally after countless hours and many profanities and promises to never use this particular strain of Maple again, we had five boxes ready for finishing. One of the interesting side effects of this design is how the Tung Oil used to finish the wood is absorbed. Generally a box presents a uniform surface to be finished but with this being such an odd 3D shape, the different surfaces all seemed to absorb the oil at different rates, so it took several extra applications in order to give it a uniform finish. After the oil had been applied and rubbed smooth, it was time to add the hardware. I was pretty nervous that pounding nails into such a thin piece of wood might cause it to split, but I got lucky and after pre-drilling the hinge and lock holes, I managed to get everything installed with no catastrophes. A couple of notes about the care of these boxes: The hinges are quite small as they had to fit on the side of the two box pieces. So please be careful opening and closing the box. They will not stand up to a lot of abuse if allowed to swing open and rock back against the hinge. The other important thing to note is that because these are solid wood pieces, they are susceptible to any drastic changes in relative humidity. The best way to care for them is to think of them as people. If they are kept in an environment that you would find uncomfortable, then they will very likely be uncomfortable as well and express that by warping in some way. The good news is if you happen to notice your box cupping or bowing, it can probably be remedied by placing it in a comfortable environment- about 40% relative humidity. Kevin Bryce has once again been hard at work putting together something very special for our vinyl release, Europe. Similar to his custom CD cases for Uncharted Places, the electronica artist turned his skills to the woodwork studio to surpass all expectations and create a unique piece of art to accompany our second vinyl release. Made with Walnut, finished with Natural Tung Oil and featuring Bubinga, Coca Bola and Koa wood inlay segments, each one is unique and has taken months to hand-craft. The design was conceived by my friend Nick Brzostowski and represents the ten tracks included on Europe. My brief to him was to represent the ten tracks in a very simple, striking way that would integrate with Kevin’s woodwork. Nick ended up with this beautiful geometric approach, pin-pointing the areas the tracks were inspired by, and connecting the design back to the four corners of the globe, alongside my home, Portland, Oregon. We ended up with a truly global effort; from Kevin in the Fraser Valley of Vancouver, to Nick in London, myself in Portland and all of the artists featured on the release across Europe. There will be just five of these special edition Europe vinyl cases available, going on sale on Sunday February 1st 2015 at 11am PST, 7pm GMT via the ASIP Bandcamp Page. They will be priced at $200 plus postage (postage is unfortunately expensive to anywhere outside of the USA). The price still doesn’t do the many hours that went into this product justice, but I want to make sure that Kevin can at least recoup his material costs and continue his trade ready for our next release. A big thank-you to Kevin Bryce for his relentless perfectionism and dedication on this project. More details on the vinyl and digital release of ASIPV002 Europe, available here.